In 1862 Charles Lutwidge Dodgson, a shy Oxford mathematician with a stammer, created a story about a little girl tumbling down a rabbit hole. Thus began the immortal adventures of Alice, perhaps the most popular heroine in English literature. 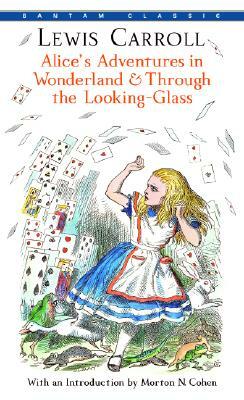 Countless scholars have tried to define the charm of the Alice books—with those wonderfully eccentric characters the Queen of Hearts, Tweedledum, and Tweedledee, the Cheshire Cat, Mock Turtle, the Mad Hatter et al.—by proclaiming that they really comprise a satire on language, a political allegory, a parody of Victorian children’s literature, even a reflection of contemporary ecclesiastical history. Perhaps, as Dodgson might have said, Alice is no more than a dream, a fairy tale about the trials and tribulations of growing up—or down, or all turned round—as seen through the expert eyes of a child. “Lewis Carroll,” creator of the brilliantly witty Alice’s Adventures in Wonderland, was a pseudonym for Charles Lutwidge Dodgson, a shy Oxford don with a stammer. He was born at Daresbury, Cheshire on January 27, 1832, son of a vicar. As the eldest boy among eleven children, he learned early to amuse his siblings by writing and editing family magazines. He was educated at Christ Church College, Oxford, where he lectured in mathematics from1855 to 1881. In 1861 he was ordained as a deacon. Dodgson’s entry into the world of fiction was accidental. It happened one “golden afternoon” as he escorted his colleague’s three daughters on a trip up the river Isis. There he invented the story that might have been forgotten if not for the persistence of the youngest girl, Alice Liddell. Thanks to her, and to her encouraging friends, Alice was published in 1865, with drawings by the political cartoonist, John Tenniel. After Alice, Dodgson wrote Phantasmagoria and Other Poems (1869), Through the Looking-Glass (1871), The Hunting of Shark (1876, and Rhyme? and Reason? (1883). As a mathematician Dodgson is best known for Euclid and His Modern Rivals (1879). He was also a superb children’s photographer, who captured the delicate, sensuous beauty of such little girls as Alice Liddell and Ellen Terry, the future actress. W.H. Auden called him “one of the best portrait photographer of the century.” Dodgson was also an inventor; his projects included a game of arithmetic croquet, a substitute for glue, and an apparatus for making notes in the dark. Though he sought publication for his light verse, he never dreamed his true gift–telling stories to children–merited publication or lasting fame, and he avoided publicity scrupulously Charles Dodgson died in 1898 of influenza.